Last July, the Vault nightclub was quietly shuttered two years after it debuted in the lower level of The 9 complex, which also includes Metropolitan Hotel, Adega and Azure rooftop bar. Since then the former club has been utilized solely as private event space. Since last summer the Geis team has been working behind the scenes to overhaul Vault, which was limited by its concept and days of operation. The nightclub was open Fridays and Saturdays only and it attracted a specific type of audience. To make the space more appealing to wider clientele, the concept will be changed to a lounge-style speakeasy overseen by Director of Bar Operations Russ Mengle. It will be open Tuesday through Saturday evenings. In place of bottle service and fireballs, the menu features 30 classic and signature cocktails that utilize fresh-squeezed fruit juices, housemade syrups, house-brewed ginger beer and farm-fresh egg whites. Millet’s Mural, for example, is named for mural artist Francis Davis Millet, who went down with the Titanic. Mosler’s Sazerac is named in honor of vault maker Mosler Safe Company. John’s Julep is a tribute to John G.W. Cowles, the first president of Cleveland Trust Company. A “Cocktail Glossary” shares these tidbits and more with visitors. For the first time, Vault will offer food to its guests: a selection of small plates and sharable items created by executive chef Nelly Buleje. Options include Oysters Cleveland baked with spinach, tasso ham and hollandaise; house-cured lamb pastrami sandwiches with aged manchego on local rye; Wagyu tartare with salsa verde, truffle oil and quail egg; beef, pork and veal meatballs with mozzarella and marinara; and duck prosciutto flatbread with French brie, figs and honey. 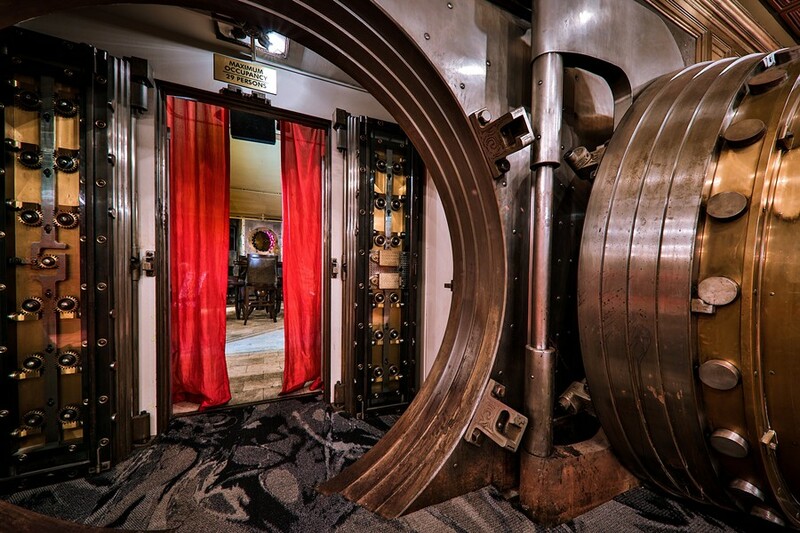 The new Vault opens to the public on April 4.